When Camel Club member Caleb Shaw nearly falls victim to one of a series of mysterious deaths targeting the elite of Washington, D.C., the members of the Camel Club attempt to unravel a secret conspiracy that threatens all of America. I gave this book a three basically because although the writing was good. The ending left something to be desired. Despite being a quick read, it was not one of Baldacci's best works. There were holes in the plot and I doubted it's entire plausibility. After reading all of the back story I wanted to know more about what would happen to Anabelle Conroy, yet I was left empty. The one plot that did conclude seemed to end quickly and not full of suspense in comparison to other details from the back story. The introduction of the characters was strange. Without previously reading the Camel Club, I had no idea who the group of four men were. I quickly forgot each of the Camel Club's characters (or at least the back story) until later in the story when their names reappeared when the 2 plots merge. Like all his books, it is just a terrific read. If you start reading it you can't put it aside. I found this sequel to The Camel Club a reasonably quick read, but a bit disjointed. The first book was a bit better. Soon after the Speaker of the House is assassinated, Caleb Shaw a quiet librarian stumbles upon the body of his boss Jonathan DeHaven at the Library of Congress narrowly escaping the same fate. “The Camel Club” group promptly sets out to investigate and it becomes a race to stop a man who is determined to auction off America to the highest bidder. After having read and loved The Camel Club, I was eager to read the sequel, The Collectors. While it is still quite good, unfortunately, it doesn't quite measure up to its incredibly clever predecessor. The main story line is interesting enough, and the 'bookish' plot is something most bibliophiles will appreciate. But Baldacci has basically created two separate stories here and fused them together via one character, turning it into one somewhat disjointed novel. There is a subplot surrounding an ambitious scheme to con a dangerous casino owner that doesn't fit well enough with the Camel Club cohorts, in my opinion. Aside from that, though, The Collectors is pretty flawless. Eccentric and quirky characters along with clever dialogue and exciting action sequences combine to create a very entertaining reading experience. As this is a review based on the audio book, I feel I should mention that I found the narration to be unpleasant. The secondary 'players' were adequate, though annoying at times, but the main narrator, LJ Gasner, has a voice that just did not work for me. It's hard to pinpoint exactly what the problem was, but I struggled throughout the book. And, I feel that I would have enjoyed the experience more had I read the book myself. 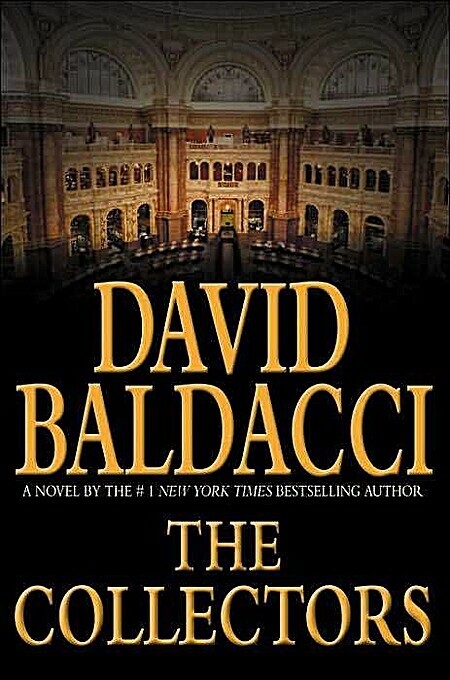 In David Baldacci's novel The Collectors, a ragtag group of men who call themselves The Camel Club get involved in investigating the death of Jonathan DeHaven, the director of the Library of Congress's Rare Books collection. As the pieces come together, they discover that someone is selling US secrets to the highest bidder. Along the way, DeHaven's ex-wife, Annabelle Conroy, a con artist of the highest caliber, joins the Camel Club to help discover why her ex was killed. Perfect book for reading on airplane. Plenty of action to keep one's attention. Ties together rare books, Atlantic City con, group of avenging talented Vietnam veterans, a professional assassin, and the Library of Congress. The four members of the Camel Club are back in the second book of the series. The Collectors focuses on a conspiracy behind the death of a rare book collector. One of the club's members, Caleb, is appointed to value and distribute the books in the deceased man's collection. This endangers Caleb as well as the others who are helping him in the process. Annabelle Conroy, a con, is introduced in this story. She is the ex-wife of the deceased and two plots gradually come together. Not bad. I'd not read a Camel Club book before, but I liked it OK.
Continues the Camel Club group. Mostly set in the Library of Congress and lots of goodies about rare books. Introduces con belle Annabelle Conroy--a great addition. Speaker of the House, head librarian of LOC killed for starters. I loved this book. It is another great Camel Club book. Baldacci's second book about the Camel Club, a group of social misfits busting global conspiracy theories. This novel features espionage at the library of Congress and introduces a new member of the club via a "long con" in Atlantic City. Great thriller!! Fantastic depth of character development and a great clean storyline. Would love to see Annabelle in future installments, and looks like I'm going get my wish unless Baldacci totally drops the ball. Thank goodness I started this series after the 3rd one has already been written so I don't have to wait. A great story, though overly complex at times. I loved the characters, and I was definitely hooked throughout the whole story. Judging by the ending, I'm thinking it's written with a follow-up book in mind.